What is one gadget that has totally transformed the way we live and function in the past decade? working behind a computer my body starts to “scream” for help with sharp pain in my upper back. Slouched posture is not a novelty in the world, however our modern reliance on smartphones is creating new problems in our bodies. In a study Assessment of Stresses in the Cervical Spine Caused by Posture and Position of the Head by Dr. Kenneth K. Hansraj, Chief of Spine Surgery at New York Spine Surgery and Rehabilitation Medicine, it was found that as the human head tilts forward the forces seen by the neck surge which can lead to early degeneration of the cervical spine as well as myofascial pain in the upper body. Another study reported that 84% of smartphone users experienced pain in at least one body part. Whether we like or not, smartphones and computers are here to stay. I don’t think that we will be going to the caveman lifestyle any time soon so it is important for us to learn good ergonomics when using our technology but also ways to release the tension that we build up after hours of screen time. In this video I will share my favorite techniques to release tension in the upper back and “open up” the slouched posture. I will be using Deep Tissue sFera massage balls but of course you can use tools that you have on hand (tennis balls, lacrosse balls etc.) The myofascial release techniques are combined with Pilates exercises and stretches for greater range of motion and increased strength. I refer to this workout as “Feels So Good” release because it will leave you feeling open and free in your upper body. Try it! This video is the final one in the Annual Pilates Holiday Challenge. I know everyone is excited to hear the name of the lucky winner of the giveaway. The lucky number of this winner is #4 in the FB comment thread. 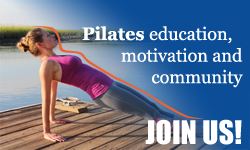 She loves Pilates because it is her SPINE SAVER. Jai Marie, please contact us through email or Fb so that we can ship the gift basket to you. Please take a moment to share the video with your friends. Share it on Facebook, Twitter, Pinterest or just the “old-fashioned” email. And please comment and let me know What videos would you like to see in 2018? Check “Also post on Facebook” to share your comment. Outfit: Ridge Merino Top, Earl Grey Leggings by INTO THE AM and Tucketts Pilates socks.